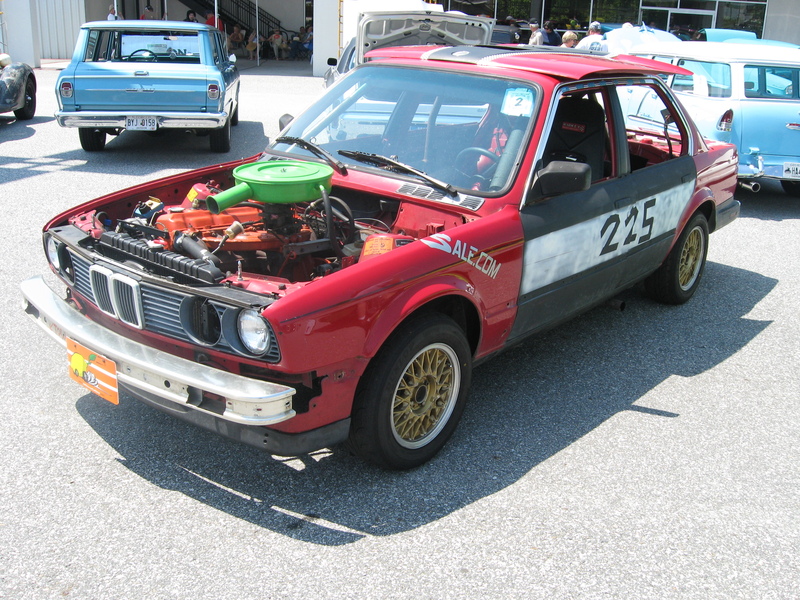 Sure, we know “winners” in racing complete the most laps or get to the finish line first, but in the 24 Hours of LeMons, the real winners take home the Index of Effluency trophy. The IOE’s name traces back to a fitting malapropism of the original(ly stupidly named) “Index of Thermal Efficiency” from that similarly named race in France. And like the efficiency award at Le Mans in its heyday, the Index of Effluency is the top prize not just because it comes with some super-rare (and therefore incredibly valuable, according to Craigslist sellers) patches, but it also pays out more than others at $601, or $1 more than the Class C winner. So how does one chase LeMons’ top prize? If you glean from Rule 1.5 in the sparse LeMons rulebook, you’ll figure out pretty quickly that effluence is characterized by words like slow, rare, worthless, huge, tiny, American, notorious, unreliable, absurd, old, ugly, worn-out, lacking in parts availability, and—generally speaking—never intended to go anywhere near a road course. The more of those characteristics displayed and the more a vehicle runs over the course of a race weekend (on a sliding scale), the more likely it is to come away with the most-coveted LeMons prize. Those big tips covered, let’s give some specific pointers on upping your effluency. Go for slow and stylish: A worn-the-hell-out 1969 Rolls Royce Silver Shadow is a nightmare to work on (ask Three Pedal Mafia about their IOE winner). It’s even downright awful to attempt to race at speed with a toe-up lump of an engine and a foot of cushy suspension travel. Yet, look at how stately 3PM’s monocled Rolls looked en route to one of the greatest displays of effluency known to man. Quite good, quite good. General-ly awful: Fools Teams that have opted for General Motors products have taken 32 Index of Effluency trophies home with them. While not all GM cars are terrible, the company’s role as the world’s largest automaker gives plenty of junk from which to choose, especially from the darker days of American automaking. Basically, any Cadillac is a good start, like the King Henry V8th Sedan de Ville, but IOEs have come from U-Body vans, a Buick Reatta, a Geo Storm, an Oldsmobile Cutlass Ciera, a 51-horsepower diesel Chevette, and of course the Donked-out Pontiac Bonneville built by LeMons Legend Jeff “Speedycop” Bloch (above) to name a few. Break American: Besides GM, you can also find a lot of Ford (17) and Mopar (11) wins in the category of effluency. Generally, the bigger and more underpowered, the better. The Tunachuckers’ 1975 Ford LTD might be the most American car to ever race LeMons, let alone win an IOE. Cross the English Channel: You really can’t go wrong with British or French cars. And by “can’t go wrong,” we mean you’ll be fighting the wretched, uphill battle that makes you LeMons-famous (a term that also means “notorious” in many circles). Interceptor Motorsports’ Renault Fuego Turbo is the quintessential LeMons car with the effluent blend of abysmal performance combining the one-two punch of horrifying reliability and utter lack of parts availability. Nothing from the other side of the Channel is going to be much better: “What does a $500 Lotus look like?” you might ask. It’s hard to say because it’s usually wreathed in dense oil smoke. It can never not be done: In other words, anything is possible. The topic of twin-engined cars came up often in early LeMons Internet discussions, always reaching the conclusion that the complexities of transmission dynamics means that—like having readable car numbers on a typical LeMons entry—It Is Impossible. The Volatile RAM/Stick Figure Racing crew decided that rather than talk about it, they’d just stitch together a front-engined Toyota Corolla GT-S and mid-engined Toyota MR2 (Watch the timelapse). And wouldn’t you know that it worked so well that they built a second one? Effluence! Get defunct out: Brands that have passed into history—the older, the better—fare well in the effluency category. The flathead Hudson Hornet was a popular IOE winner, as was the Rambler Classic. Better than that, though, is Studebaker. To date, only two have shown up and both teams have gone home to sew fresh IOE patches on their oil-spattered racing overalls. Inevitably, many will respond to the horror of racing a classic Studebaker in LeMons as a travesty of the automotive world. “That could have been saved!” Well, look at it this way: If a classic Studebaker is selling for $500, then (A) the world has had ample time to save it so you could almost always have saved it first and (B) the car is almost always beyond saving or restoring. NSF Racing dredged their Silver Hawk from the depths of Florida’s gator-infested swamps and slapped a small-block Mopar under its patina’d hood. Effluency tastes sacrilicious: The Studebaker outrage brings us to the next point. Nothing is sacred in LeMons. Want to drop a Chrysler Slant Six in a BMW E30? Awesome. You could even go several steps farther by stuffing the unbearably awful Oldsmobile 350 diesel engine in a Corvette and running it on veggie oil like Mike “Spank” Spangler did. That didn’t win him an IOE because it (shockingly) never ran, but his Harley V-twin-powered Toyota Prius, coined the “Toyohog,” ran flawlessly, albeit with the refinement of a clothes dryer full of starter motors. The result? A mind-boggling IOE, of course, that offended pious hybrid owners and bikers alike. Never underestimate the power of obscurity: The automotive world is big and, between the cracks, a few daft companies tried to pry their way into the American automotive market. Total Loss Racing’s Lada Signet came into the country from Canada and won an IOE for the Motherland, but the noble Humber Super Snipe might take the cake as the most obscure LeMons IOE winner. You may remember the Super Snipe from the time it handily defeated Roadkill’s Rotsun in LeMons, but Roadkill will maybe have its revenge. Want to be hailed as a hero? Bring a Plymouth Cricket to race in LeMons. Never underestimate the power of absurdity: We mentioned 3 Pedal Mafia above with their Rolls Royce, but the New Jersey team really made a name for themselves by dropping a 14-foot 1971 Sea Sprite fiberglass hull onto a Chevy S10 frame. Known as “The Boat” in a series that could easily apply that name to a multitude of land yachts, the Sea Sprite is shockingly quick and fairly competent on the racetrack. Their onboat video camera is also responsible for the most puzzling motorsports screen capture of all time. It helps to be crazy: This is generally good advice, but it certainly applies to Speedycop’s Cessna 310 race car conversion (or really any of his builds), Spank’s cross-country road trip in a French hooptie, and Mike Harrell flat-towing a Saab 96 LeMons car 700 miles behind a nearly identical Saab 96 street car. Who will take home the final Index of Effluency for 2015? Come find out at Sonoma Raceway in California this weekend. Free entry and ALL fees for the next race which is a minimum value of $1300. Besides, it is a lot more fun than chasing a class win. You get to screw with a terrible car and then try to race it. The Rotsun IS cool. My 6 year old son LOVES it. And it is one of those ‘sad sack’ cars that needs someone to give it some love. And Finnegan is that someone. Keep her in the fleet and get her running, folks. I say drop an LT1 into it. You can source them stupid cheap out of an F-Body or B-Body. It had different license plates when it went up against the Subaru in the abandoned town. One of my favorite roadkill cars, love to cheer for it. When this car competed in 24 laps of lemons it was one of my favorite episodes. Like many commenters below, I have my own ideas how I would like to see it rebuit. Instead of a boring old LS swap I think roadkill should stick with the six cylinder turbocharged concept in the Ratsun. I have recently developed a kink for old american inline sixes and would love to see you drop one in the car. You are Mopar guys and I think the Chrysler slant six would be a good candidate, Chrysler raced them for a short time during the early sixties and offered performance parts from the factory. I think it would be cool to see an engine build episode on HotRod Garage like they did with the Fury wagon, showing all the head work and block preparation. A Roadkill episode would follow with all four of you guys called Ratsun Resurrection where you drop the engine in the car with another transmission and go racing. Why not drop a big Ford six in it? Of course bring back the Turbo.